A few years ago, if I had been perusing the admittedly excellent candy section in Cost Plus World Market, there’s no chance I would have found a 3 POUND bag of mixed sour gummies. They just weren’t that common, and if they did exist, they sure as hell wouldn’t be made by “Candytech”. Nope, they’d be Haribo, perhaps the cut rate Trolli. But that’s it. Today though, it’s go time. Things are different. Options are here. And what does it all teach us? 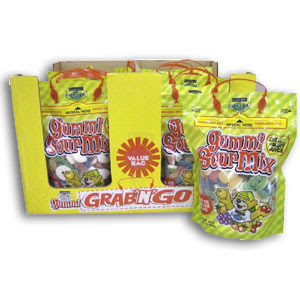 Here’s the story- I saw a 3 or 4 lb bag of these assorted sour gummies in Cost Plus. The whole bag was no more than 6 bucks, so of course I bought it. In the bag, you’ll find some shaped like snakes, fruits, rings, and a few others. Some have a white side to them (creamy foam) with the sour colored gummy on the other side, but most are solid gummies. The first thing you’ll do is smell these. Way before you taste them. Big time aroma factor, but it’s not horrible, so…it didn’t put me off. If there was a bowl of these in front of you, you’d eat some. No doubt. They’re not bad-they’re just not particularly good. These fall victim to the usual problem-you can’t discern the actual flavor of the gummies. They all just sort of taste like the color they are, to a degree, and are sort of sour. All of the consistencies are similar-standard, not-too-hard gummy. Not hard enough. And that’s it. Honestly, I really don’t have anything else to say about these. I thought it was cool that such a large amount could be purchased for so little cash, but…you get what you pay for. And if you’re willing to pay $6 for this, you might as well buy 3 or 4 bags of Haribo instead. They have a sour mix called “Tangfastics” that is the BOMB (although, this one sadly is only available in the UK). In addition, their “Fruity Pasta”, “Sour Cherries” and “Sour ‘Speghetti” are all excellent. Bottom Line: Once again, I find myself buying another candy for the first and final time. Would I Buy Again? : Can’t you read, fool??!! Jonny – thank you for throwing yourself on the grenade for the rest of us. Someone has to save us from ourselves. I walked past a giant two pound bag of chocolate eggs in World Market – at first drawn in by the sheer quantity (and the shiny wrappers) but I vered away. And now I’m so glad! I know they would have been subpar – but there were so many and they were so shiny…..thank you for giving me the strength not to drive back there and get them. I had these same candies at our roto baseball draft last Sunday and I wholeheartedly agree – they aint good. I thought these gummies were great, tasted sour, great mix, like the package and actually wish I could find this in more stores.